Competitions exist because the companies that run them get publicity. That’s the reason that they are run – because it promotes a particular brand, shop, website or service. There is an understanding between the entrant and the promoter for Facebook and Twitter competitions, which simply goes like this : You promote our brand and we will offer a prize in return. It’s actually more than an understanding. There are laws involved with the promotion and running of competitions. These administration of these rules falls within the remit of the Advertising Standards Authority. It’s a serious business with real financial penalties for those found to be flouting those rules. It’s for this reason that there is such interest in companies that break these rules by running fake competitions. This article by SuperLuckyDi went interstellar when it exposed a company running an apparently dodgy competition. People who enter competitions should be able to spot these dodgy competitions quite easily because they do stick out like a sore thumb. It’s surprising, for example, how many small companies appear to be able to afford to give away top of the range iPads on a regular basis. There are other signs of a dodgy comps which you can look out for. 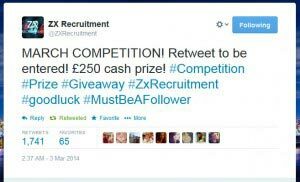 ZX Recruitment has an account on Twitter. It’s a bit odd for a recruitment company in that most of the tweets are generic nonsense about current events. They also run a monthly cash giveaway on Twitter. It’s now up to £250 a month and it’s quite popular. Last month’s competition (above) generated 1, 741 retweets. All well and good, right? Spot anything odd? Given that this is a twitter competition, why doesn’t the winning announcement have the @username of the winner? 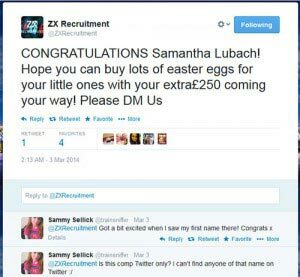 How do ZX Recruitment know the real name and location of the winner if he hasn’t been in touch yet? There are some Michael Carters on Twitter, and even one from Brighton, but I can’t find any that entered this competition. Again, no winning username. A reply to this tweet also notes that this (distinctive) name doesn’t appear to have a Twitter account, and I can also not find a RT for this competition that matches this description. Look at the replies to the tweet. Someone else has noticed the issue as well. To be clear, I’m not saying that the competition is dodgy. What am I saying is that it appears to be dodgy. The company also has a Facebook page, but the competition isn’t run there. That rules out the winner coming from Facebook. ZX Recruitment – please consider this to be an open invite to contact me to provide a response to the above. I’d be delighted to hear from you and I will make public your response, all in the name of fairness and transparency. I’ll be tweeting the link to this page to ZX Recruitment. For the rest of you who are interested in stuff like this, check out Ste Appleton on Facebook who investigates things like this. I’ve also spotted a few contenders for scam competition awards which I’ll follow up with shortly. I’d also be interested in hearing any similar things you’ve spotted…. Next post An Irregular Update. And Numbers.